It’s the Friday before the Super Bowl, one of the highest pizza-eating days of the year. In fact, it is considered one of the top 3 foods for the big game. We won’t be having pizza on Sunday so we decide to have ours for Date Night. 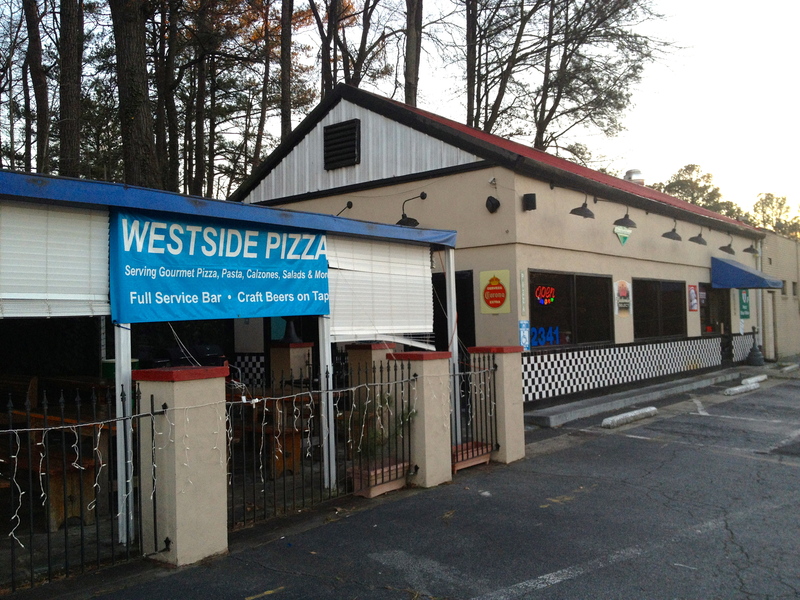 We are at Westside Pizza because of a recent article in the AJC about two guys who have eaten at 99 pizza places in Atlanta and they deemed Westside the best in the city. The conventionally-cooked pizza here will be judged against two wood-fired Date Night favorites, Antico and Vesuvius. Westside really isn’t on the trendy Westside area we have been visiting, but is in on the west side of the city. We have a little trouble finding the restaurant because it’s “odd” number address is really on the “even” side of the street, and the name on the sign is actually Westside Bar-Café Italiano. Happily this is the only snag we will run into on this extremely cold night. Westside is on Marietta Blvd. in “South Smyrna”. 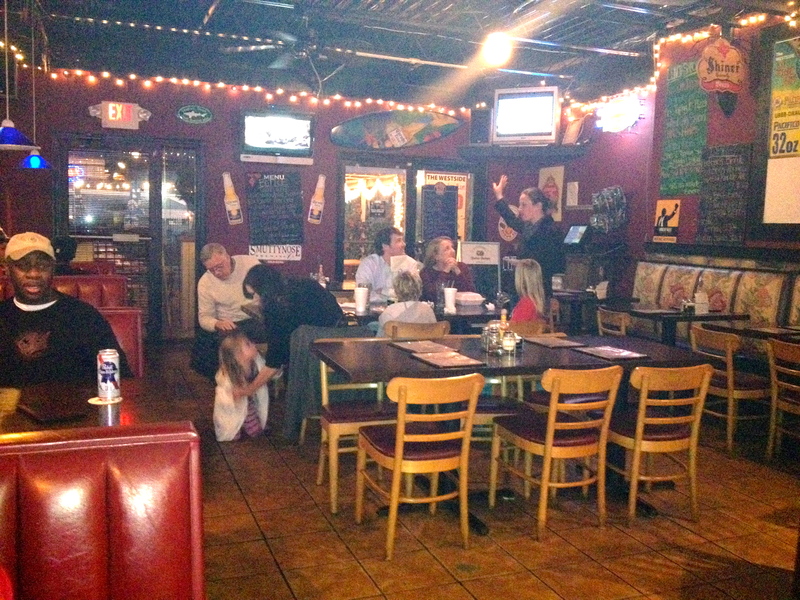 It’s a small, cozy rectangular room with a significant bar and an impressive craft beer menu. The AJC article is framed and strategically placed by the entrance to the kitchen. The seating area is small but it is probably doubled in warm weather months because of a large covered patio that sort of makes us wish we had saved this visit for spring. The dining room. A lot more can fit outside, but not in this weather. You enter by the bar and are immediately welcomed by the friendly bartender. It’s around 6pm and we are invited to seat ourselves, so we pick a booth near the bar, and away from the children. The décor reminds us of a local pizza “joint”, not the sterile corporate pizza places that have become the standard these days. It has charm rather than the multi-million dollar trendiness we have experienced in the last few Date Nights. Our waitress, Courtney greets us as soon as we are seated. The list of beer on draught is on a chalkboard across the room. It is hard to choose but since we rarely see Bell’s best brown on tap, and it was our favorite selection of the night during our “5 Bells of Christmas” beer dinner (Date Night #53, 12/13/12). We both order this rich brown brew. 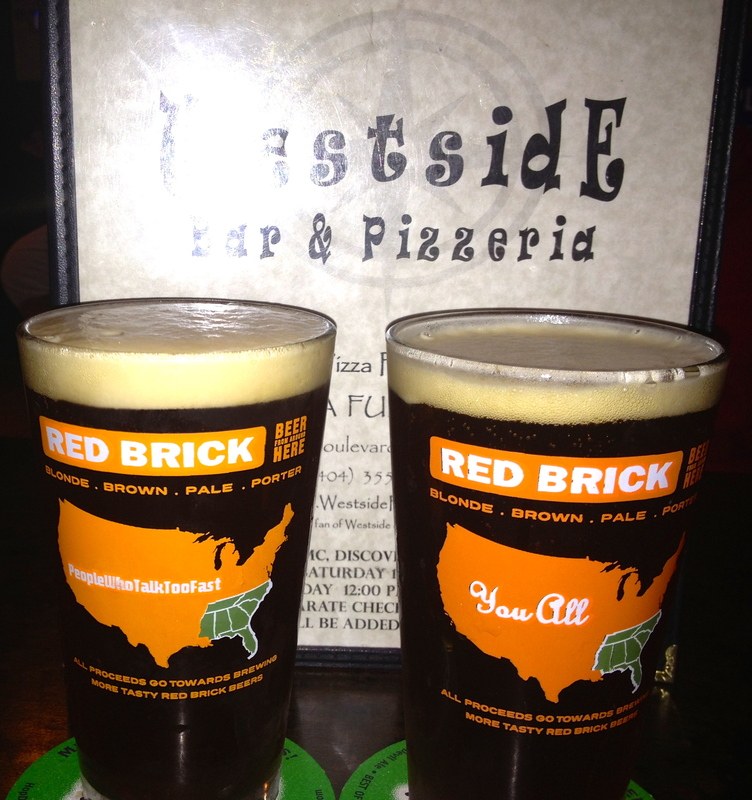 Bells Best Brown, served in Red Brick glasses. 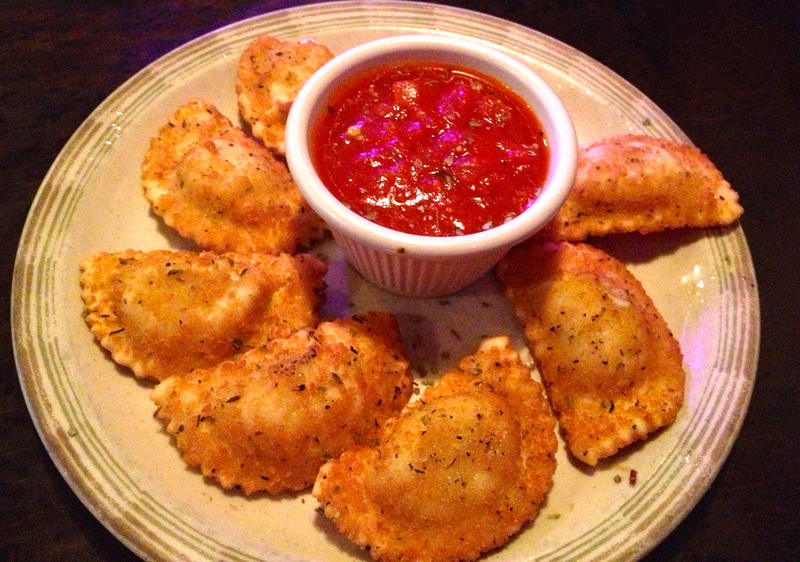 The menu has an appealing list of appetizers and we are tempted by the Fried Ravioli. When Courtney says it’s her favorite, the deal is finalized and we put in our order. How do you make ravioli better? Fry it! We choose well as they are spiced and crunchy on the outside and delightfully cheesy on the inside. The dipping sauce is a happy preview of what will be on our pizza. The menu contains much more than “just” pizza, but we are staying with our Super bowl theme and do not really consider the calzones, salads, traditional Italian dishes or subs. There are many specialty pizzas, or you can create your own. 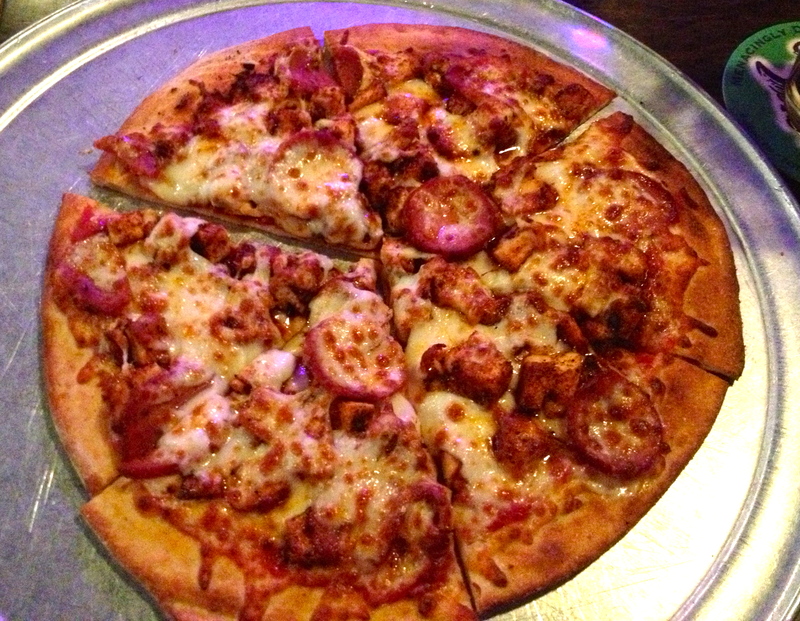 It’s thin crust and you can choose between 10, 14 or 18 inch pies. If you go with the 10 inch, you can have whole wheat crust. We are interested in variety and in honor of the New Orleans Super Bowl we order a 10” Cajun pizza on a regular crust, and a 10” Margherita on the whole wheat crust. Cajun pizza. Mamma mia, it’s spicy! The Andouille sausage and blackened chicken are spicy enough to make any Cajun proud and our Bell’s Browns help to put out the fire. 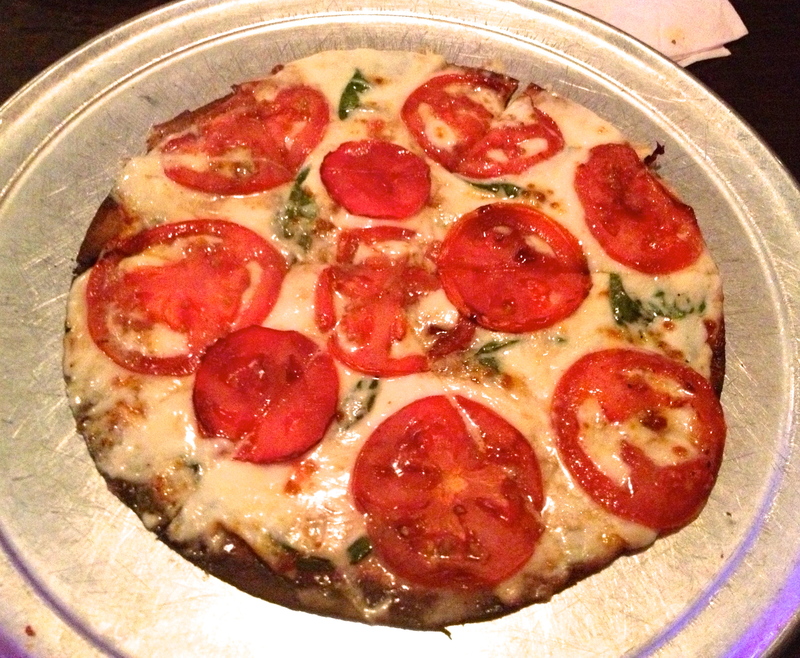 The Margherita pie has a beautiful taste of basil in every bite. Margherita pizza. Can you smell the basil? It’s less cheesy, and since we ordered the whole wheat, we accept the fact that his crust is not as crispy, but it is still thin and delicious. There are no leftovers, and there is no room for dessert. The pizza and beer is so good we don’t feel like we miss out on anything. We see why Westside gets good ratings in the blogging world. It looks like they are doing a thriving delivery/takeout business as well. Let’s hope they are ready for what will be a busy day on Sunday. We’ll try to visit again in the spring so we can enjoy the deck and do our part to monitor quality control!